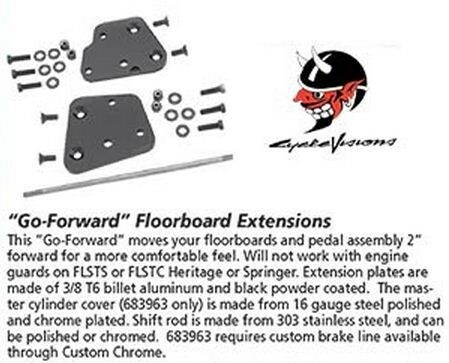 This "Go-Forward" moves your floorboards and pedal assembly 2" forward for a more comfortable feel. Will not work with engine guards on FLSTS or FLSTC Heritage or Springer. Extension plates are made of 3/8 T6 billet aluminum and black power coated. The master cylinder cover (1986-1999 only) is made from 16 guage steel polished and chrome plated. Shift rod is made from 303 stainless steel, and can be polished or chromed. Models from 1986-1999 require custom brake line available through Custom Chrome only.